Lister erases Holly's memory of Agatha Christie so that he can enjoy rereading them (having already read every book ever written). There are quite a few Commodores in episodes of Red Dwarf. Always makes me smile to see them there. Not sure which episode this is but the one with where Kryton attaches one of his eyes to his hand and it crawls up Listers leg - there I believe is an Amiga 2000 in the episode (it's clearly an Amiga as it only has 10 function keys). Weird that I was about to post a very similar comment only to see that (another - I'm hoping!) 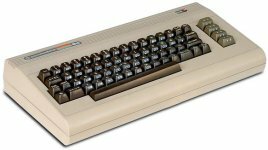 Chris already posted it... Or did I post it and someone has used a C64 to erase my memory...?